“The List” 2013 | Azazel's Bitz Box. This is what I managed to get finished in 2013 – 158 miniatures in total. Not a bad effort, but well short of 365. 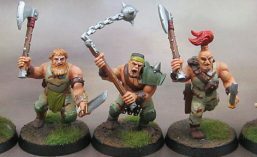 Some of these models got shown off at the time, but I wasn’t blogging all that frequently yet, and so I’ve been showing some of them off more recently – mixed in with the more newly-completed stuff.